The Realtor Banner For Real Estate Agents Comes with Many Messages! Each Flag Needs Only One Person for Set-Up! This Realtor Banner is 8' Tall! 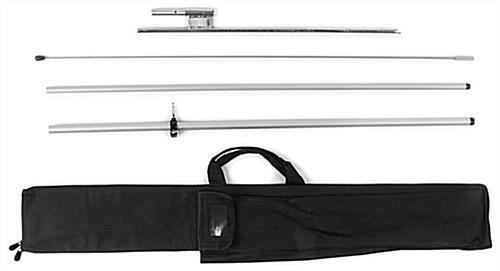 (4) Piece aluminum and fiberglass pole for portability and a low price point. Black nylon carrying bag enables agents to carry the banner to showings. 8' Height ensures everyone in the vicinity sees there is an open house. 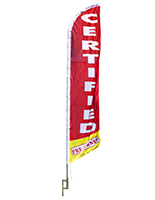 This realtor banner flutter flag is specifically designed for portability, allowing real estate agents to quickly set up and take down the banner for use at different showings! A black nylon carrying bag is included with purchase. The realtor banner that stands 8' high has an aluminum and fiberglass pole, which can be taken apart into four segments for storage in the carrying case. There are also separate slots in the bag for the ground spike and polyknit flag. 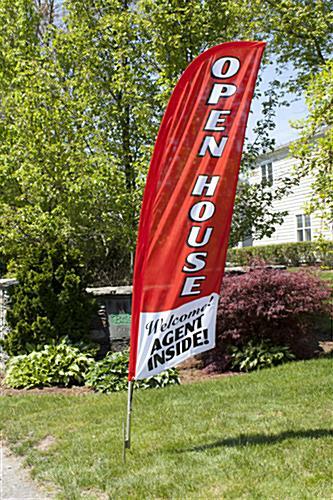 This realtor banner, also called a flutter flag, is less expensive than similar models due to a carefully engineered design that balances affordability with quality and durability. Since the top (2) sections of the pole have a fiberglass construction, they bow in the wind like all feather flags, yet the bottom (2) aluminum pole sections make this unit more affordable than many other similar displays found online. The message on this realtor banner will almost always be viewable because the lightweight fabric pennant gently flutters with minimal wind. When compared with a traditional yard sign, these banners are simply more effective at capturing the attention of a target market. 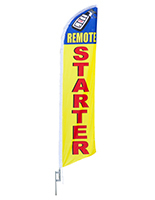 The realtor banner comes with a ground spike base for instantly setting up on a grassy surface. Flags have a lightweight, knitted polyester fabric construction that is water resistant for outdoor use. 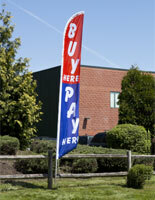 The realtor banner measures approximately 24"w x 72"h, large enough for cars to read from a distance. 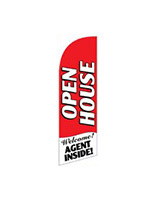 White lettering on a red background makes the main "OPEN HOUSE" message pop out to viewers. "Welcome! AGENT INSIDE!" 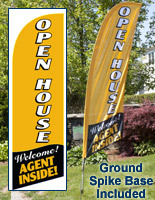 then appears under the vertically oriented text to make the 8' realtor banner more welcoming to potential buyers. 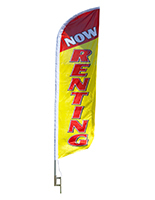 The real estate specific message printed on these feather flags can be used at properties for rent, lease or sale. The realtor banner that is pre-printed ships fast, since the unit is currently stocked in inventory and does not require any customization whatsoever. 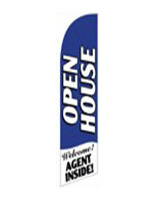 Agents and agencies that have multiple listings can buy these flutter flags in high volume quantities for additional savings off the already low price. There are numerous messages available in the same color scheme, font style and size to create an even more enticing outdoor exhibit!